General Principles and Processes of Isolation of Elements is an important chapter of CBSE Class 12th Chemistry. This is chapter number 6th of NCERT Class 12th Chesmitry text books. Questions based on this chapter are frequently asked in CBSE Class 12th board examinations. In this article, you will get important notes of this chapter. General Principles and Processes of Isolation of Elements is the most important chapter of CBSE Class 12th Chemistry. This is chapter number 6th of NCERT Class 12th Chesmitry text books. Questions based on this chapter are frequently asked in CBSE Class 12th board examinations. Here, you will get important notes of this chapter. The naturally occurring substances in the form of which the metals occur in the earth’s crust are called minerals. The mineral from which a metal can be extracted profitably and conveniently is called an ore. The earthy impurities like sand, rock, etc., that surround the worthy mineral in a ore, are called called gangue. The scientific and technological process used for separating metal from its ore is known as metallurgy. The process of removal of unwanted materials from the ore is called concentration or benefaction of the ore. Hydraulic washing: In this method, the lighter earthy impurities are washed away from the heavier ore particles. Thus this method of concentration of ore is based on the difference in specific gravities of the ore and gangue particles. Magnetic separation: This method is based on the magnetic and non-magnetic properties of the ore components. Froth flotation: This method is quite useful for the purification of the sulphide ores. The mineral particles are wetted by oils and the gangue particles by water. As a result. the ore particles become light and rise to the top in the form of froth while the gangue particles become heavy and settle down. The froth can be stabilised by the addition of stabilisers like aniline or cresols. Calcination: It is the process of converting an ore into its oxide by heating it in a limited supply of air or in absence of air, below its melting point. The volatile matter is burnt away and the oxide of the metal is obtained. This process is useful for metal carbonates and hydroxides. For example: CaCO3 → CaO + CO2 and Al2O3.2H2O → Al2O3 + 2H2O. Roasting: It is the process of converting an ore into its oxide by heating the ore in excess of oxygen (air). This process is commonly used for suiphide ores. The metal present in metal oxide can be converted from cationic form to free by supplying electrons, i.e., by reduction of metal oxide. The nature of reducing agent used depends upon the activity of metal. For example: If the metal is very reactive like Na, K, electrolytic reduction method is used whereas the less reactive metals like Cu, Sn, Fe can be reduced by chemical reducing agents like CO, H2, etc. The process of using carbon in form of coke, charcoal, CO to reduce metal oxides to respective metals, is termed as smelting. Because of highly inflammable nature of H2 it is used as a reducing agent especially for oxides of Tungsten (W) and Molybdenum (Mo). The impurities are collected at the bottom of anode and are called anode mud. It is the method used to get elements of very high purity like Ge, Si, B, Ga. The method is based on the principle that the impurities are more soluble in the melt than in the pure metal. The method is specially useful for producing semiconductors of very high purity. This method of purification is useful for low boiling metals. Examples are purification of zinc and mercury. Liquation In this method of purification, a low melting metal like tin can be made to flow on a sloping surface and thus separated from higher melting impurities. In this method a low melting metal like tin can be made to flow on a sloping surface. In this way it is separated from higher melting impurities. (ii) The volatile compound should be easily decomposable, so that the recovery is easy. This method is based on the principle that different components of a mixture are differently adsorbed on an adsorbent. The method is suitable for such elements which are available only in minute quantities and the impurities are not very much different in their behaviour from the element to be purified. It is used for the refining of Ni. Nickel on heating with CO form volatile Ni(CO)4 which when subjected to high temperature decomposes to give pure nickel. Where, ΔH is enthalpy change and ΔS is entropy change. The sign of ΔG depends on the sign of ΔH, ΔS and the temperature. When the value of ΔG is negative, only then the reaction will proceed. 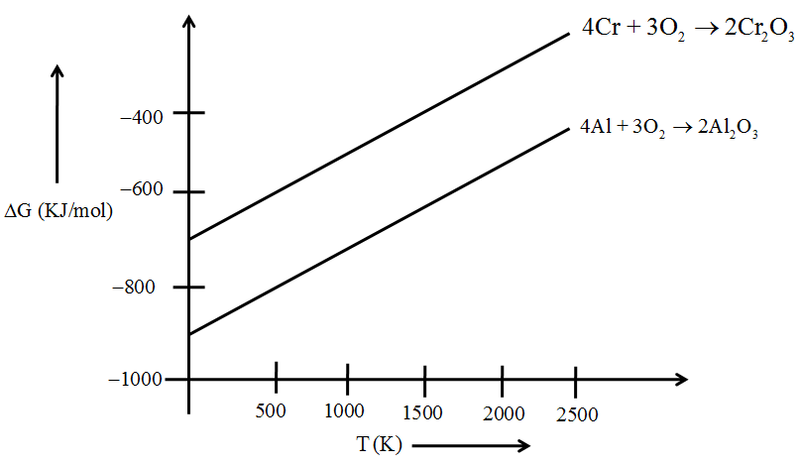 If ΔS is positive, on increasing the temperature (T), the value of TΔS would increase (ΔH < TΔS) and then ΔG will become –ve. The graphical representation of Gibbs energy is known as Ellingham diagram. Such diagrams help us in predicting the feasibility of thermal reduction of an ore. The height of the line in an Ellingham diagram indicates the instability of the oxide (or the sulphide ore) since the higher the line, the more positive the ΔG, the less spontaneous the formation of the oxide (or the sulphide). Example: Consider the reduction of Cr2O3 by Al. The haematite ore (Fe2O3) is first calcined and then subjected to smelting. The charge consisting of calcined haematite, coke and limestone is fed into the blast furnace from its top. A blast of hot air is passed near the base of the blast furnace. The coke undergoes combustion at the bottom of the furnace producing CO2 at about 1900 K. According to the Ellingham diagram, CO is more stable compared to CO2 to CO only above 1000 K , thus at 1900 K , CO is formed. It cools as it rises up the furnace and at a temperature of about 1000 K, the CO/CO2 line so that CO is able to reduce the iron oxide to iron. Pig iron: Iron obtained from a blast furnace is called pig iron and contains about 4% carbon and other impurities such as S, P, Si and Mn. Cast iron: It is the iron that contains about 3% carbon, extremely hard, cannot be welded and brittle. Wrought iron: Also known as malleable iron, it is the purest form of iron. It is prepared by oxidising the impurities in cast iron in a reverberatory furnace lined with haematile. The solidified copper obtained has blistered appearance due to the evolution of SO2 and so it is called blister copper.